Bio-nanotechnology is the key functional technology of the 21st century. It is a fusion of biology and nanotechnology based on the principles and chemical pathways of living organisms, and refers to the functional applications of biomolecules in nanotechnology. It encompasses the study, creation, and illumination of the connections between structural molecular biology, nutrition and nanotechnology, since the development of techniques of nanotechnology might be guided by studying the structure and function of the natural nano-molecules found in living cells. Biology offers a window into the most sophisticated collection of functional nanostructures that exists. This book is a comprehensive review of the state of the art in bio-nanotechnology with an emphasis on the diverse applications in food and nutrition sciences, biomedicine, agriculture and other fields. It describes in detail the currently available methods and contains numerous references to the primary literature, making this the perfect “field guide” for scientists who want to explore the fascinating world of bio-nanotechnology. Safety issues regarding these new technologies are examined in detail. 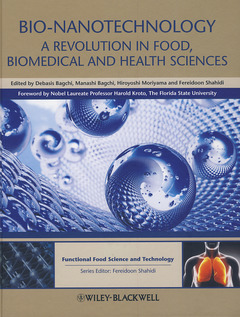 The book is divided into nine sections – an introductory section, plus: Nanotechnology in nutrition and medicine. Nanotechnology, health and food technology applications. Nanotechnology and other versatile applications. Nanomaterial manufacturing. Applications of microscopy and magnetic resonance in nanotechnology. Applications in enhancing bioavailability and controlling pathogens. Safety, toxicology and regulatory aspects. Future directions of bio-nanotechnology. The book will be of interest to a diverse range of readers in industry, research and academia, including biologists, biochemists, food scientists, nutritionists and health professionals.